How to load disqus when scroll to the bottom of the page? It is comment hosting service for web sites and online communities. It provide Services so that you can add comment system in your website. Question: When Disqus was Launched? 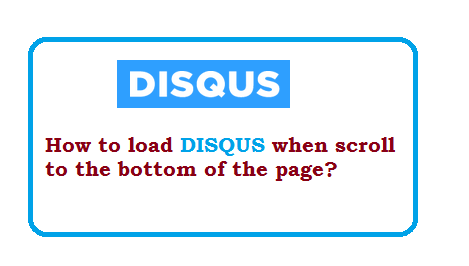 Question: Can we embed disqus in website? Question: Does it provides channel for discussion? Yes, It provides channel to discuss. Question: What is offical website of Disqus? Question: Can facebook user post comment using their fb account? Question: How to load disqus when scroll to the bottom of the page?